Uh-oh spagetti-o: New Zealand Flag Day is in October and this year, like last year, Kiwi nutzis will be assembling en masse to rally ’round the flag. The New Zealand Flag is the symbol of the realm government and people of New Zealand. Its royal blue background is reminiscent of the blue sea and clear sky surrounding us. The stars of the Southern Cross emphasise this country’s location in the South Pacific Ocean. The Union Flag gives recognition to our historical foundations and the fact that New Zealand was once a British colony and dominion. As New Zealand’s national symbol the New Zealand Flag should be treated in a manner worthy of its high status. The Flags, Emblems, and Names Protection Act 1981, administered by the Ministry for Culture and Heritage, defines and protects the Flag. Contained in the Act is the power to prosecute those who misuse it. We want to work on Unity in this country. We are going to be up against a large Anti counter protest year at the Flag Day. Anti Websites seem to be getting active again and our infiltrators have told us that they are strengthening again after the terrorist arrests that they were going through last year. We are up against a hardened Left Wing and Anarchist Alliance now that may take things further. We must be ready for this. We must stand together in Unity and Pride. Victory only comes to those who plan and work in an organised and productive manner. We ask you all to support this cause. Please send us donations and any other help you can give. We need a good turn out at Flag Day and other demonstrations. 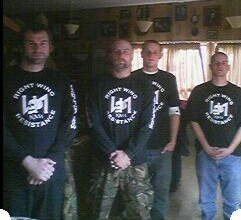 ‘RWRNZ’ (‘Right Wing Resistance New Zealand’) is the latest brainchild of Kyle ‘The Mormon’ Chapman, and credit where credit is due: the YouTube video documenting their initiation ceremony is totally awesome, and scores 88 on The Bizarro Scale, a rating achieved by way of the fact that: the ceremony looks like it’s taking place in someone’s back shed; the use of cheesy props (a sword by The Pieman); and last, but not least, the fact that the assembled racist bozos vow to stand strong “against the delusions of our European Culture and pride”. Note that Kyle, the führer of RWRNZ, declared only last month that he had put his wicked ways behind him, exchanging his love of racist ratbaggery and The White Man for the love of God and his wife: see : nutzis are W E I R D : Kyle Chapman. The Mormon. (May 3, 2009). This entry was posted in Anti-fascism, State / Politics and tagged Kyle Chapman, New Zealand Flag Day, Right Wing Resistance New Zealand. Bookmark the permalink. He’s tricksy. Like a Jedi. Where was Kyle, Mr Bozo? Did his wife tell the Frunt that he was busy and that he couldn’t come out to play today? Or did God whisper in his ear? Come back Kyle—the Waikato is missing you. …he even pleaded to be given a chance. …if he cannot even keep his wedding vows then he is is not a person of integrity and should not be trusted. Voltaire once said prejudice is what a fool calls reason. A former National Front member’s fairytale marriage to a Waikato woman is over as he ramps up his involvement in the white supremacy movement again. Kyle Chapman, who vowed to give up his far-right activities when he married devout Mormon Claire Clifford in May, has been linked to the white pride group Right Wing Resistance, which has been patrolling the streets of New Brighton in Christchurch. Mr Chapman, once convicted of fire-bombing a marae, co-ordinated a gathering at the Wellington Cenotaph this weekend for the far-right’s annual Flag Day observance. He was among about 30 members of the National Front and Right Wing Resistance who converged on central Wellington. Left-wing counter-demonstrators stayed away this year to avoid giving the marchers a bigger profile. Mrs Chapman told the Waikato Times today she and Kyle Chapman separated last night because he had refused to maintain his wedding day promises. “Kyle hasn’t given up things that he said he was going to but that was probably always on the cards because he is so in love with it,” she said. When contacted by the Waikato Times, Mr Chapman said he no longer spoke to the media. 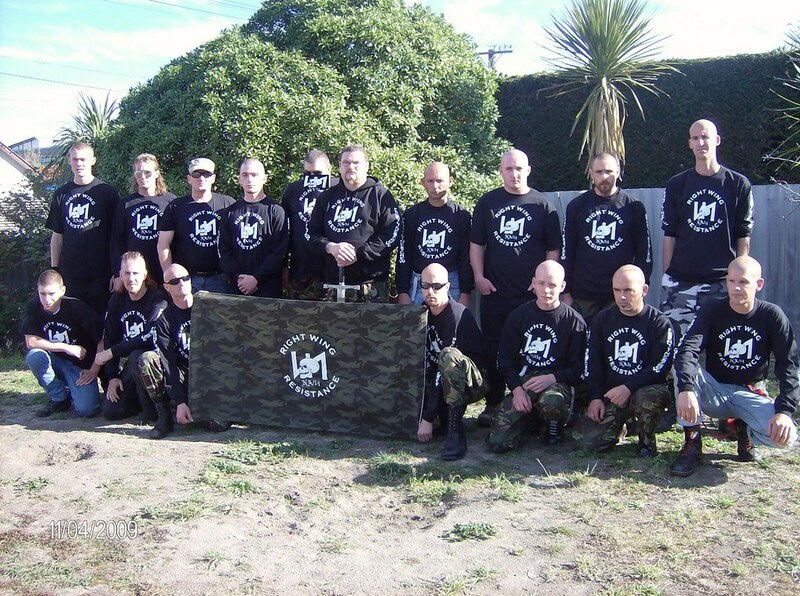 The Right Wing Resistance, which Mr Chapman has described as the “street arm” of his Nationalist Alliance, says Christchurch is the centre of a “white pride” revival. It now claims to have members in five cities. Mr Chapman has also been continuing his attempts, announced in January, to found a “European Nationalist land base” in Canterbury and has been appealing for donations. In May, the Waikato Times reported how the 38-year-old former leader of the National Front married the former Miss Clifford and moved from Christchurch to live with her on her lifestyle block on the outskirts of Hamilton. In an exclusive interview on the day of his wedding, Mr Chapman pleaded with people to give him a chance to turn his life around after quitting his roles with the Nationalist Alliance and The Survive Club. He said at the time he “wanted to have a nice peaceful life with Claire”. Mrs Chapman is pregnant with Mr Chapman’s child but she said she intended to divorce him. The baby is due in February. Mrs Chapman said Mr Chapman no longer lived with her and she understood he was living in Paeroa with a group of followers.